10:1 dilution ratio when used with a pressure washer. Use 1 gallon jug directly w/ pressure washer chemical injector. Contains "Oil Grabber" a unique additive which penetrates the surface to dissolve tough stains from grease, oil, algae, mildew and dirt. Promotes the adhesion of paint, stains, sealers, and other coatings. Contains "Sporex" a unique biodegradable additive which removes and inhibits tough stains from mildew, mold, algae, fungus and moss to restore wood or composite deck or fences. 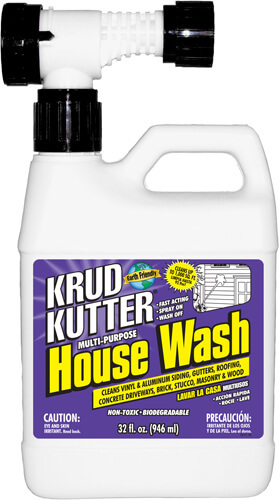 Dissolves the toughest stains from: dirt, oil, grease, bird droppings, tree sap and acid rain. Great for wood, composites and almost any other deck / fence material. Formulated with "Sporex" a unique biodegradable additive to remove and inhibit tough stains from mildew, mold, algae, fungus and moss. This product will clean, degrease, and restore almost all outdoor surfaces. Use on vinyl or aluminum siding, gutters, roofing, concrete, brick, stucco, masonry, and wood. 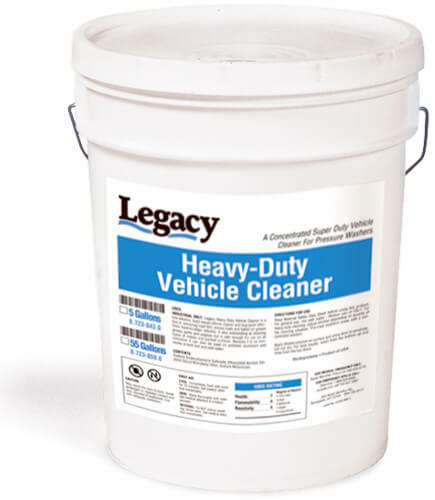 Commercial strength formula that removes dirt, oil, grease, mildew stains, and more! Recommended for use on vinyl, aluminum & wood siding, awnings, gutters, porch screens, driveways, pool areas, engines, equipment and more. Use hose spray bottle directly w/ garden hose or the 1 gallon jug w/ pressure washer chemical injector. Removes tough stains from dirt, mold, algae, mildew & more! A major breakthrough in house wash technology. The proprietary formulation contains "Sporex", a unique additive which removes tough stains from mildew, mold, algae, fungus and moss, and leaves the surface completely clean. Special surfactants penetrate the surface to safely and easily dissolve the toughest stains from dirt, oil, grease, bird droppings, tree sap, and acid rain. Even removes gray weathering on wood, chalking, and oxidation. Recommended for use on exterior siding (wood, vinyl, and aluminum), roofing, gutters, wood decks & fences, stucco, brick and cement block, masonry, concrete driveways, walkways & walls, patio furniture, and boats. A high-performance, general purpose cleaner formulated to remove all types of dirt, grit, grease and soap scum. It is non-caustic, non-butyl, low-foaming with alcohol for extra effective cleaning of painted surfaces.Good in hot and cold water and safe on vehicle, buildings, decks and fences. 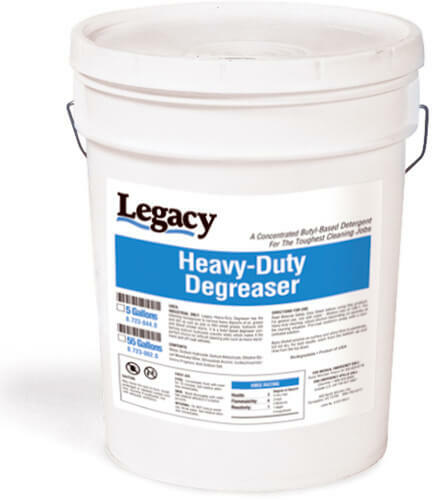 A highly effective, non-caustic, butyl-based degreaser that works well with hot or cold water. Biodegradable and safe for use on all metals and painted surfaces, including engines and vehicles. Also cleans mildew, soap scum and baked on grease. A liquid, highly concentrated vehicle cleaner effective on engine degreasing, parts cleaning, hard-to-clean vehicles, road film, smoke trails, etc that is safe on polished aluminum and contains a wax for an attractive finish that keeps dirt from adhering. Highly concentrated, non-fuming, acid-based pressure washer cleaners with extra wetting agents for the toughest of cleaning jobs, such as road film. 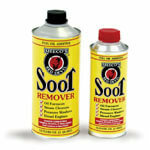 Cleans and restores oxidized aluminum. Removes carbon, grease, oils and diesel smoke. 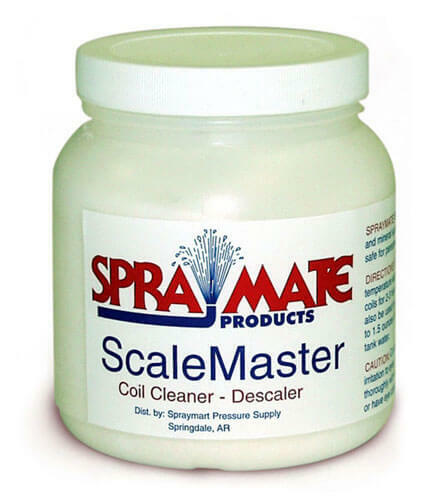 ScaleMaster removes mineral and scale buildup in heating coils, restoring them to peak performance. Usage: Mix ScaleMaster per instructions. Circulate thru coil for 2 to 3 hours to remove lime and scale buildup. ScaleMaster solution will prevent mineral and scale buildup when metered into water supply tank at 1/4 tsp. 1/3 oz. per gallon. This is biodegradable, safe on equipment and easy to use coil cleaner. Granular powder that works to dissolve lime and scale buildup on coils. Used as directed, it is safe for personnel equipment. It contains a built-in inhibitor that offers protection to most metal surfaces. 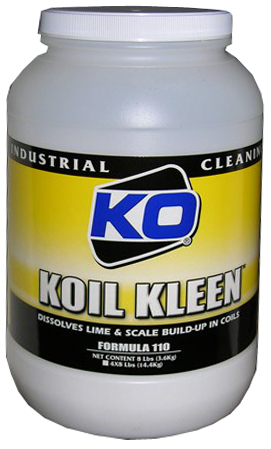 Usage: Dissolve 1 pound of Koil Kleen to each gallon of cool water. Do NOT USE BURNER SYSTEM. Circulate through coil for 1 to 3 hours depending on scale build-up. Flush with fresh water when finished. 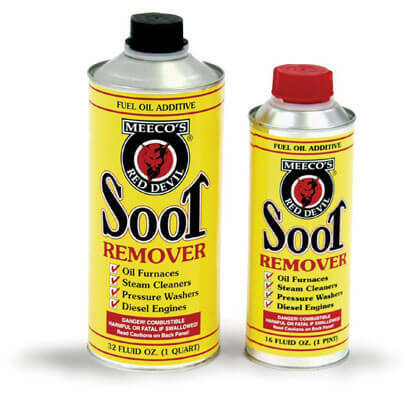 Formulated to attack existing soot formations and prevent further buildup. This keeps the heating system cleaner, combats formation of sludge and gum, emulsifies and removes water from fuel tank, and harmless to metal.